Aldrich Hazen "Rick" Ames (/eɪmz/; born May 26, 1941) is a former Central Intelligence Agency (CIA) officer turned KGB double agent, who was convicted of espionage in 1994. He is serving a life sentence, without the possibility of parole, in the Federal Correctional Institution in Terre Haute, Indiana, United States. Ames was formerly a 31-year CIA counterintelligence officer who committed espionage against the U.S. by spying for the Soviet Union and Russia. At the time of his arrest, Ames had compromised more highly-classified CIA assets than any other officer in history until Robert Hanssen's arrest seven years later in 2001. Ames was born in River Falls, Wisconsin, to Carleton Cecil Ames and Rachel Ames (née Aldrich). His father was a college lecturer at the Wisconsin State College-River Falls and his mother a high school English teacher. Aldrich was the eldest of three children and the only son. In 1952, his father began working for the CIA's Directorate of Operations in Virginia, and in 1953 was posted to Southeast Asia for three years, accompanied by his family. Carleton received a "particularly negative performance appraisal" in part because of serious alcoholism and spent the remainder of his career at CIA headquarters. Ames attended high school at McLean High School in McLean, Virginia. Beginning in 1957, following his sophomore year, he worked for the CIA for three summers as a low-ranking (GS-3) records analyst, marking classified documents for filing. In 1959, Ames entered the University of Chicago planning to study foreign cultures and history, but his "long-time passion" for drama resulted in failing grades, and he did not finish his sophomore year. Ames worked at the CIA during the summer of 1960 as a laborer/painter. He then became an assistant technical director at a Chicago theater until February 1962. Returning to the Washington area, Ames took full-time employment at the CIA doing the same sort of clerical jobs he had performed in high school. Five years later, Ames completed a bachelor's degree in history at the George Washington University. He did not originally plan to have a career with the CIA, but after attaining the grade of GS-7, and receiving good performance appraisals, he was accepted into the Career Trainee Program, despite several alcohol-related brushes with the police. In 1969, Ames married fellow CIA officer, Nancy Segebarth, whom he had met in the Career Trainee Program. When Ames was assigned to Ankara, Turkey, Nancy resigned from the CIA because of a rule that prohibited married partners from working from the same office. Ames's job in Turkey was to target Soviet intelligence officers for recruitment, and he succeeded in infiltrating the Communist Dev-Genç organization through a roommate of student activist Deniz Gezmiş. In spite of this success, Ames's performance was rated only "satisfactory", and Ames, discouraged by the critical assessment, considered leaving the CIA. In 1972, Ames returned to CIA headquarters and spent the next four years in the Soviet-East European (SE) Division. His performance reviews were "generally enthusiastic", apparently because he was better at managing paperwork and planning field operations than at agent recruiting. Nevertheless, his excessive drinking was also noted, and two "eyes only" memoranda were placed in his file. In 1976, Ames was assigned to New York City where he handled two important Soviet assets. His performance was excellent, and he received several promotions and bonuses, being ranked above most operations officers in his pay grade. However, his tendency to procrastinate in submissions of financial accounting was noted. Ames's inattention to detail also led him to commit two important security violations, including once leaving a briefcase of classified operational materials on the subway. Ames apparently received only a verbal reprimand. In 1981, Ames accepted a posting to Mexico City while his wife remained in New York. His evaluations in Mexico were mediocre at best, and he engaged in at least three extramarital affairs. In October 1982, Ames began an affair with María del Rosario Casas Dupuy, a cultural attaché in the Colombian Embassy and a CIA informant. Despite CIA regulations, Ames did not report his romance with a foreign national to his superiors, even though some of his colleagues were well aware of it. Ames's lackluster performance reviews were in part the result of heavy drinking. At a diplomatic reception in Mexico City, Ames got into a loud, drunken argument with a Cuban official that "caused alarm" among his superiors. Nevertheless, in September 1983, the CIA assigned Ames back to the SE division in Washington. His reassignment placed him "in the most sensitive element" of the Department of Operations, which was responsible for Soviet counterintelligence. Ames had access to all CIA plans and operations against the KGB and the GRU, Soviet military intelligence. In October, Ames formally separated from Nancy, and, in November, he submitted an "outside activity" report to the CIA noting his romantic relationship with Rosario. As part of his divorce settlement, Ames agreed to pay the couple's debts plus provide Nancy monthly support for three-and-a-half years, a total of about $46,000. Ames thought the divorce might bankrupt him, and later said that this financial pressure was what had first led him to consider spying for the Soviet Union. Rosario also proved to be a heavy spender, phoning her family in Colombia at a cost of $400 a month, and going on shopping sprees — after her arrest the FBI discovered sixty purses in the Ames's house, more than five hundred pairs of shoes, and 165 unopened boxes of pantyhose. 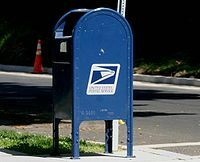 Replacement of the mailbox used by Ames: a horizontal chalk mark above the USPS logo would signal a needed meeting. Garfield St and Garfield Terrace NW. Original in the Spy Museum. Ames routinely assisted another CIA office that assessed Soviet embassy officials as potential intelligence assets. As part of this responsibility, and with the knowledge of both the CIA and the FBI, Ames began making contacts within the Soviet Embassy. In April 1985, Ames provided information to the Soviets that he believed was "essentially valueless" but would establish his credentials as a CIA insider. He also asked for $50,000, which the Soviets quickly paid. Ames later claimed that he had not prepared for more than the initial "con game" to satisfy his immediate indebtedness, but having "crossed a line" he "could never step back". Ames soon identified more than ten top-level CIA and FBI sources who were reporting on Soviet activities. Not only did Ames believe that there was "as much money as [he] could ever use" in betraying these intelligence assets, but their elimination would also reduce the chance of his own espionage being discovered. By 1985, the CIA's network of Soviet-bloc agents began disappearing at an alarming rate. The CIA realized something was wrong but was reluctant to consider the possibility of an agency mole. Initial investigations focused on possible breaches caused by Soviet bugs, or a code which had been broken. The CIA initially blamed asset losses on another former CIA agent, Edward Lee Howard, who had also been passing information to the Soviets. But when the CIA lost three other important sources of information about whom Howard could have known nothing, it was clear that the arrests (and executions) were the result of information provided by another source. As one CIA officer put it, the Soviets "were wrapping up our cases with reckless abandon", which was highly unusual because the "prevailing wisdom among the Agency's professional 'spy catchers'" was that suddenly eliminating all the assets known to the mole would put him in danger. In fact, Ames's KGB handlers apologized to him, saying they disagreed with that course of action, but that the decision to immediately eliminate all American assets had been made at the highest political levels. Meanwhile, Ames continued to meet openly with his contact at the Soviet embassy, Sergey Dmitriyevich Chuvakhin. For a time, Ames summarized for the CIA and FBI the progress of what he portrayed as an attempt to recruit the Soviet. Ames received $20,000 to $50,000 every time the two had lunch. Ultimately, Ames received $4.6 million from the Soviets, which allowed him to enjoy a lifestyle well beyond the means of a CIA officer. In August 1985, when Ames's divorce became final, he immediately married Rosario. Understanding that his new wealth would raise eyebrows, he developed a cover story that his prosperity was the result of money given to him by his Colombian wife's wealthy family. To assist with that fabrication, Ames wired considerable amounts of his espionage payments to his new in-laws in Bogota, to help improve their impoverished status. In 1986, following the loss of several CIA assets, Ames told the KGB that he feared he would be a suspect. The KGB threw U.S. investigators off Ames's trail by constructing an elaborate diversion, in which a Soviet case officer told a CIA contact that the mole was stationed at Warrenton Training Center (WTC), a secret CIA communications facility in Virginia. U.S. mole hunters investigated 90 employees at WTC for almost a year and came up with ten suspects, although the lead investigator noted that "there are so many problem personalities that no one stands out". In 1986, Ames was posted to Rome. There, his performance once again ranged from mediocre to poor and included evidence of problematic drinking. Nevertheless, in 1990–1991, he was reassigned to the CIA's Counterintelligence Center Analysis Group, providing him with access to "extremely sensitive data", including information on U.S. double agents. The CIA mole hunt team, circa 1990. From left to right: Sandy Grimes, Paul Redmond, Jeanne Vertefeuille, Diana Worthen, Dan Payne. In late 1986, the CIA assembled a team to investigate the source of the leaks. 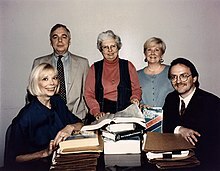 Led by Paul Redmond, and consisting of Jeanne Vertefeuille, Sandra Grimes, Diana Worthen, and Dan Payne, the team examined different possible causes, including the possibilities that the KGB had bugged the agency, or intercepted its communications, or had a mole in place. By 1990, the CIA was certain that there was a mole in the agency, but could not find the source. Recruitment of new Soviet agents came to a virtual halt, as the agency feared it could not protect its current assets. Prior to that, in November 1989, a fellow employee reported that Ames seemed to be enjoying a lifestyle well beyond the means of a CIA officer, and that his wife's family was less wealthy than he had claimed. Diana Worthen, who had known Rosario Ames prior to her marriage, had met with Rosario one day to discuss installing drapes in the Ames residence. Worthen, who had recently installed drapes in her own home, knew they could be expensive and asked which room to concentrate upon first, to which Rosario laughed and said "Do not worry about the price, we are going to have the whole house done at once!" Worthen also knew that Rosario's parents had little money, but a CIA contact in Bogota observed that her family was now well-off. Nevertheless, the CIA moved slowly. When the investigator assigned to look at Ames's finances began a two-month training course, no one immediately replaced him. Investigators were also diverted by a false story from a CIA officer abroad who claimed that the Soviets had penetrated the CIA with an employee born in the USSR. In 1986 and 1991, Ames passed two polygraph examinations while spying for the Soviet Union and Russia, respectively. Ames was initially "terrified" at the prospect of taking the test, but he was advised by the KGB "to just relax". Ames's test demonstrated deceptive answers to some questions but the examiners passed him, perhaps, in the later opinion of the CIA, because the examiners were "overly friendly" and therefore did not induce the proper physiological response. Cosmetic dentistry: Ames's teeth, which were yellowed by heavy smoking, were capped. Attire: previously, Ames had been known for "bargain basement" attire, but suddenly changed to wearing tailor-made suits not even his superiors could afford. Premium credit cards, on which the minimum monthly payment exceeded his monthly salary. In March 1993, the CIA and FBI began an intensive investigation of Ames that included electronic surveillance, combing through his trash, and a monitor installed in his car to track his movements. From November 1993 until his arrest, Ames was kept under virtually constant physical surveillance. When, in early 1994, he was scheduled to attend a conference in Moscow, the FBI believed it could wait no longer, and he and his wife were arrested on February 21, 1994. At his arrest, Ames told the officers, "You're making a big mistake! You must have the wrong man!" On February 22, 1994, Ames and his wife were formally charged by the Department of Justice with spying for the Soviet Union and Russia. Ames's betrayal resulted in the deaths of a number of CIA assets. He pleaded guilty on April 28 and received a sentence of life imprisonment. As part of a plea bargain by Ames, his wife received a five-year prison sentence for tax evasion and conspiracy to commit espionage. In court, Ames admitted that he had compromised "virtually all Soviet agents of the CIA and other American and foreign services known to me", and had provided the USSR and Russia with a "huge quantity of information on United States foreign, defense and security policies". It is estimated that information Ames provided to the Soviets led to the compromise of at least a hundred U.S. intelligence operations and to the execution of at least ten U.S. sources. Furthermore, Ames's betrayal of CIA methods allowed the KGB to use "controlled agents" to feed the U.S. both genuine intelligence and disinformation from 1986 to 1993. Some of this "feed material" was incorporated into CIA intelligence reports, several of which even reached three Presidents. Ames said he was not afraid of being caught by the FBI or CIA but was afraid of Soviet defectors, saying, "Virtually every American who has been jailed in connection with espionage has been fingered by a Soviet source". Additionally, when asked about the polygraph tests, Ames said, "There's no special magic. Confidence is what does it. Confidence and a friendly relationship with the examiner. Rapport, where you smile and you make him think that you like him." Ames is Federal Bureau of Prisons prisoner #40087-083, serving his life sentence in the medium-security Federal Correctional Institution (FCI) in Terre Haute, Indiana. The CIA was criticized for not focusing on Ames sooner, given the obvious increase in his standard of living. There was a "huge uproar" in Congress when CIA Director James Woolsey decided that no one in the agency would be dismissed or demoted. "Some have clamored for heads to roll in order that we could say that heads have rolled," Woolsey declared. "Sorry, that's not my way." Woolsey resigned under pressure. Ames's attorney, Plato Cacheris, had threatened to litigate the legality of FBI searches and seizures in Ames's home and office without traditional search warrants, although Ames's guilty plea made the threat moot. Congress then passed a new law giving that specific power to the Foreign Intelligence Surveillance Court. Vitaly Yurchenko was a KGB officer in the Fifth Department of Directorate K, "the highest-ranking KGB officer ever to defect to the United States". In August 1985, he defected via Rome to the United States, only to repatriate to the Soviet Union three months later. Ames was privy to all information that Yurchenko gave to the CIA and was able to transmit it to the KGB, which allowed easy cover-ups of lost information. Yurchenko returned to the Soviet Union in 1985 and was reassigned to a desk job within the FCD as a reward for helping to keep Ames's spying a secret. Major General Dmitri Polyakov was the highest-ranking figure in the GRU, giving information to the CIA from the early 1960s until his retirement in 1980. He was executed in 1988 after Ames exposed him. He was probably the most valuable asset compromised by Ames. One CIA official said of Polyakov, "He didn't do this for money. He insisted on staying in place to help us." Colonel Oleg Gordievsky was the head of the London rezidentura (station) and spied for the SIS (MI6). Ames handed over information about Gordievsky that positively identified him as a double agent, although Gordievsky managed to escape to the Finnish border, where he was extracted to the United Kingdom via Norway by the SIS before he could be detained in the Soviet Union. Adolf Tolkachev was an electrical engineer who was one of the chief designers at the Phazotron company, which produces military radars and avionics. Tolkachev passed information to the CIA between 1979 and 1985, compromising multiple radar and missile secrets, as well as turning over classified information on avionics. He was arrested in 1985 after being compromised by both Ames and Edward Lee Howard, and was executed in 1986. Valery Martynov [Wikidata] was a Line X (Technical & Scientific Intelligence) officer at the Washington rezidentura. Martynov revealed the identities of fifty Soviet intelligence officers operating from the embassy, and technical and scientific targets that the KGB had penetrated. Martynov's name was given to the KGB by Ames, and Martynov was executed. Major Sergei Motorin was a Line PR (Political Intelligence) officer at the Washington rezidentura, whom the FBI tried to blackmail into spying for the U.S. He eventually cooperated for his own reasons. Motorin was one of two moles at the rezidentura betrayed by Ames and quickly executed. Colonel Leonid Poleshchuk was a Line KR (Counter-intelligence) agent in Nigeria, also betrayed by Ames. Poleshchuk's arrest was attributed to a chance encounter in which KGB agents had observed a CIA agent loading a dead drop. After some time, Poleshchuk was seen removing the contents. Sergey Fedorenko was a nuclear weapons expert assigned to the Soviet delegation to the United Nations. In 1977, Ames was assigned to handle him, and Fedorenko betrayed information about the Soviet missile program to Ames. The two men became good friends, hugging when Fedorenko was about to return to Moscow. "We had become close friends", said Ames. "We trusted each other completely." Ames was initially hesitant to inform on his friend, but soon after handing over the majority of the information, he decided to betray Fedorenko to "do a good job" for the KGB. Back in the USSR, Fedorenko used political connections to get himself out of trouble. Years later, Fedorenko met his friend Ames for an emotional reunion over lunch and promised to move to the U.S. for good. Ames promised to help. Shortly after lunch, Ames betrayed him to the KGB for a second time. Fedorenko escaped arrest, defected, and is currently living in Rhode Island. In a 2004 interview with Howard Philps Hart, who was the CIA Station Chief of Bonn, West Germany in the late 1980s, it was revealed that in 1988, Ames also betrayed a Mikoyan Gurevich Design Bureau Engineer who had been working with the CIA for 14 years, and had provided complete technical, test, and research data on all of the Soviet Union's fighter jets. According to Hart, his information "allowed the US Government to prevent the skies from being blacked out by Soviet bombers, saved us billions of dollars ... since we knew precisely what they could do". Ames's story is dramatized in the 1998 movie Aldrich Ames: Traitor Within, starring Timothy Hutton as Ames. The 2014 ABC miniseries The Assets is based on the book Circle of Treason: A CIA Account of Traitor Aldrich Ames and the Men He Betrayed by Sandra Grimes and Jeanne Vertefeuille, two of the investigators who uncovered Ames's espionage. Grimes is one of the central characters in the series. Ames was portrayed by American actor Joseph DiMartino in the television program Mysteries at the Museum (Season 2, Episode 6) which chronicled the Aldrich Ames story and the infamous mailbox used as a signal. Ames was also mentioned in the 2003 film The Recruit, which uses the examples of Ames, Nicholson and Howard, to examine the ways in which the CIA works to prevent external espionage, but is, and always will be, subject to internal espionage. Ames is featured in Ben Macintyre's best selling book The Spy and the Traitor: The Greatest Espionage Story of the Cold War. Ames was also a subject of thematic card in a Cold War related board game Twilight Struggle. ^ "Aldrich Ames Criminal Complaint" (PDF). Archived from the original (PDF) on 2016-03-04. Retrieved 2014-01-02. ^ "Aldrich Hazen Ames". FBI. ^ An Assessment of the Aldrich H. Ames Espionage Case and Its Implications for U.S. Intelligence: Report Prepared by the Staff of the Select Committee on Intelligence, United States Senate [84-046] (Washington: U. S. Government Printing Office, 1994), 4. ^ "Assessment," 5; "Ames, Aldrich Hazen Biography". S9.com. Retrieved 2010-05-07. ^ "Assessment," 5. Nevertheless, Nancy Ames performed part-time administrative work in her husband's office. ^ Suzal, Savas (1997-03-02). "Disislerinde CIA Köstebegi". Sabah (in Turkish). Retrieved 2008-10-13. . Ames made multiple payments for information that included the names of Dev-Genç members Gezmiş knew and the details of their activities. ^ "Assessment," 6. At a Christmas party in 1974, Ames was discovered intoxicated and in "a compromising position" with a female CIA employee. However, a bright point in that assignment was Ames's handling of a Czech asset, preventing his recapture, which so impressed Ames's superiors that he was recommended for a more demanding assignment. ^ a b "Assessment," 8–9. ^ "Assessment," 18–19. To deposit the money, Ames maintained several bank accounts and divided the cash into amounts under $10,000 to avoid bank reporting requirements. ^ Pincus, Walter (September 24, 1994). "CIA: Ames Betrayed 55 Operations; Inspector General's Draft Report Blames Supervisors for Failure to Plug Leak". The Washington Post. p. A1. ^ Weiner, Tim (November 2, 1994). "Senate Report Faults C.I.A. for Ineptitude in Spy Case". The New York Times. p. A1 https://www.nytimes.com/1994/11/02/us/senate-report-faults-cia-for-ineptitude-in-spy-case.html. ^ "Assessment," 33–35. Ames's immediate supervisors were aware of his alcohol abuse and his proclivity to sleep at his desk, but his annual performance reviews "consistently rated him a strong performer". ^ "The People of the CIA ... Ames Mole Hunt Team — Central Intelligence Agency". Cia.gov. April 30, 2013. Retrieved 2014-01-03. ^ "Analysis," 48. The investigation into this tale suggested a fabrication "for career enhancing or financial reasons." ^ "Assessment," 44–45; Weiner, Johnston & Lewis 1995, pp. 89–90 The KGB instructed Ames to get "a real good night's sleep. Be fresh and rested. Be cooperative. Develop rapport with examiner. And try to remain as calm and easy as you can". ^ "Assessment," 45–46. Pete Early depicts Ames as being able to convince himself that the answers he was giving were actually truthful. Also, according to Early, except for a handful of staff members, the CIA had largely abandoned trying solving the case, and more credit for the resolution should be given the FBI. Christopher Lehmann-Haupt, "Aldrich Ames: Brilliant or Bumbling?" New York Times, February 24, 1997, review of Pete Early, Confessions of a Spy. ^ "Crime Library – Crime News and Stories". Crimelibrary.com. Archived from the original on 2013-07-08. Retrieved 2014-01-03. ^ "Assessment," 50–51. The monitor sometimes failed, frustrating the FBI on several occasions. ^ "FBI History: Famous Cases – Aldrich Hazen Ames". FBI.gov. Retrieved 2013-08-18. ^ Bromwich, Michael R. (April 1997). "A Review of the FBI's Performance in Uncovering the Espionage Activities of Aldrich Hazen Ames". Retrieved 2011-04-26. ^ "FBI History: Famous Cases – Aldrich Hazen Ames". FBI.gov. Archived from the original on 29 January 2010. Retrieved 2010-01-12. . Rosario Ames was released from federal custody after she completed her sentence. ^ "An Assessment of the Aldrich H. Ames Espionage Case and Its Implications for U.S. Intelligence – Senate Select Committee on Intelligence – 01 November 1994 – Part One". Fas.org. Retrieved 2013-08-18. ^ Fischer, Benjamin (2016). "Doubles Troubles: The CIA and Double Agents during the Cold War". International Journal of Intelligence and CounterIntelligence. 29 (1): 51–52. doi:10.1080/08850607.2015.1083313. ^ Pincus, Walter (April 29, 1994). "Money wasn't only reason Ames sold U.S. secrets". Waterloo Courier. Newspaperarchive.com. p. A3. Archived from the original on January 29, 2013. Retrieved 2014-01-03. ^ "Ames: Separated Spy, Agent Lives". Daily Press. Articles.dailypress.com. April 29, 1994. Retrieved 2014-01-03. ^ Zanontian, Anthony. "Complete Guide to the Russian KGB — Key Players". Math.ucsd.edu Cryptography Archive. Archived from the original on 29 October 2008. Retrieved 2008-10-14. ^ "Tolkachev, A Worthy Successor to Penkovsky". Cia.gov. Retrieved 2014-01-03. ^ a b c "CIA Traitor Aldrich Ames". Crimelibrary.com. p. 3. Archived from the original on July 9, 2008. Retrieved 2008-10-14. 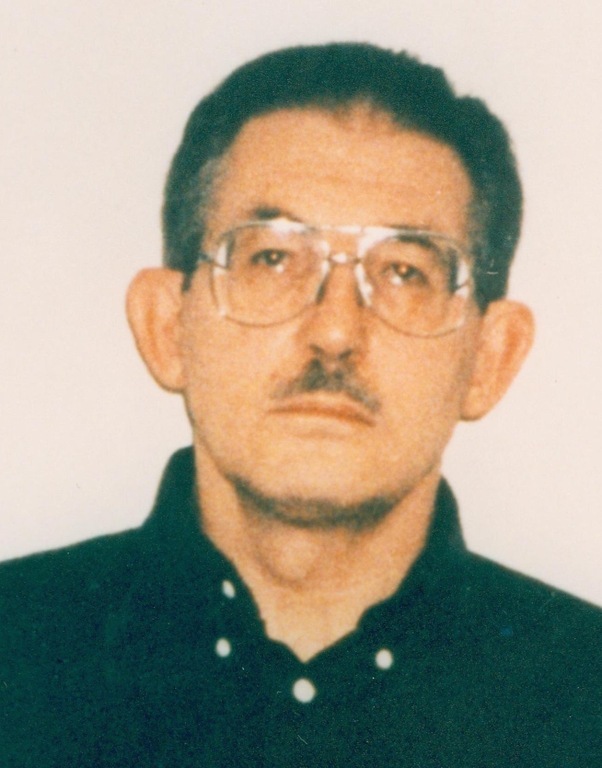 ^ "CIA Traitor Aldrich Ames". Crimelibrary.com. p. 2. Archived from the original on 13 October 2008. Retrieved 2008-10-14. ^ "videofact". Videofact.com. Archived from the original on 27 September 2008. Retrieved 2008-10-14. ^ "CIA Capabilities". c-span.com. 12 December 2004. ^ Abby-9 (29 November 1998). "Aldrich Ames: Traitor Within (TV Movie 1998)". Internet Movie Database. ^ Andreeva, Nellie (July 23, 2013). "ABC Orders Cold War Limited Series 'The Assets' For 2014". Deadline Hollywood. Retrieved 2013-12-17. ^ Kondolojy, Amanda (November 19, 2013). "ABC Releases Midseason Schedule: 'Betrayal' in Limbo, 'Revenge' Moves to 10PM, + 'Suburgatory' Premieres January 15". TV by the Numbers. Retrieved 2013-12-17. Cherkashin, Victor; Feifer, Gregory (2005). Spy Handler: Memoir of a KGB Officer: the True Story of the Man Who Recruited Robert Hanssen and Aldrich Ames. New York: Basic Books. ISBN 978-0-465-00968-8. Doyle, David W. Inside Espionage: A Memoir of True Men and Traitors, 2000, ISBN 978-0-9536151-4-8. Earley, Pete. Confessions of a Spy: The Real Story of Aldrich Ames, New York: G. P. Putnam's Sons, 1997. ISBN 0-399-14188-X. Grimes, Sandra and Vertefeuille, Jeanne. Circle of Treason: A CIA Account of Traitor Aldrich Ames and the Men He Betrayed, Naval Institute Press, 2012, ISBN 978-1-59114-334-5. Maas, Peter. Killer Spy: The Inside Story of the FBI's Pursuit and Capture of Aldrich Ames, America's Deadliest Spy, Warner, 1995, ISBN 0-446-51973-1. Weiner, Tim; Johnston, David; Lewis, Neil A. (1995). Betrayal: The Story of Aldrich Ames, An American Spy. New York: Random House. ISBN 978-0-679-44050-5.